A growing body of research suggests that bacteria in the gut influence overall human health. While past research has indicated that trillions of bacteria thriving in the human digestive tract can affect everything from immune system function and nutrition to mood, two new studies have found that gut bacteria influence diet as well as reproductive success in fruit flies. These new findings may have important implications for humans. The digestive tract of humans and most other animals contain trillions of microorganisms that are known to affect many physiological traits. Two new studies from the Macquarie University Department of Biological Sciences and the University of Sydney's SOLES department examined the impact of gut bacteria in fruit flies. The research, which was published in Current Biology, found that gut bacteria in the flies had an effect on their foraging habits and ultimately their reproductive success. The research also indicated that this influence could be passed down to the next generation of fruit flies. The teams found that fruit flies do not simply forage for nutrients that will balance their diet; they also forage for bacteria to encourage healthy cultures in their digestive tract. The fruit flies showed a strong preference for smells associated with beneficial forms of bacteria in food with less preference shown for foods lacking these types of bacteria. A separate study, conducted by the same team of researchers, examined the reproductive success of fruit flies based on changes in gut bacteria. Researchers began by inoculating fruit flies with different species of microbes to examine how the changes in gut bacteria influenced the sexual interaction of the flies. This study, published in Biology Letters, found that the investment the flies make in reproduction and their ultimate success, along with offspring body mass, was influenced by bacteria in the gut. These are not the only studies published this year on fruit flies and gut bacteria. Another study, published in PLOS Biology, demonstrated how the bacteria influence the flies' nutritional decisions. Researchers divided the flies into three groups. One was fed a solution with all necessary amino acids and the second group received a mix of amino acids necessary to make protein but without the amino acids to synthesize it. With the third group, researchers removed amino acids one by one to analyze which could be detected by the bacteria. After three days, flies in all groups received a buffet with their typical solution or the option of a protein-rich yeast. The flies in the groups without amino acids got a strong craving for the yeast to make up for the nutrients. When five types of bacteria were introduced, the flies lost the desire to eat protein. The team also found that the amino acid levels in the flies were not replenishing, which indicates the bacteria were not replacing nutrients in the flies' diet by producing the amino acids but instead turning them into new chemicals. The researchers believe the bacteria was producing chemicals that may tell the host fly it could continue without amino acids. This would trick the flies into continuing reproduction, even though the deficiency would impact cell growth. This study found that Acetobacter and Lactobacillus bacteria were the most effective at influencing the flies' appetites. Increasing the levels of both bacteria could essentially suppress a fly's appetite for protein and encourage sugar consumption, restoring reproductive function when it would normally be hampered by the nutritional deficiency. Previous research has also shown that fruit flies prefer mating with partners who have a similar gut bacteria composition rather than flies whose gut bacteria is too different from their own. In humans and other animals, microorganisms in the gut and on the body—collectively called the microbiome—play a role in many physiological traits and behaviors. The immune system, gastrointestinal system and stress have all been found to interact. For example, psychological stress causes a near-immediate change in the population of gut bacteria, and some of the bacteria influence the effect of stress on the immune system. Stress, through its effect on gut bacteria, and the immune system can also alter brain function. In some people, gut bacteria can play a role in anxiety, stress, depression and memory. 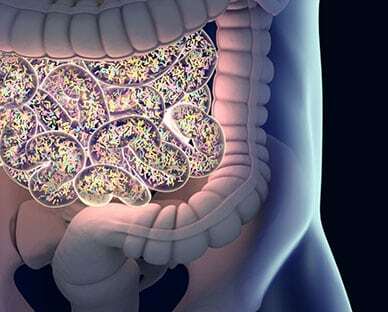 Researchers have even found that to communicate, gut microbes can produce many of the same neurochemicals that relay information in the human brain. Among these neurochemicals are dopamine, serotonin and GABA, all of which are used by human neurons to regulate mood. All of this research indicates that it may be more important than anyone really understands to maintain a healthy balance of gut flora. There are several ways to do this, including eating a diet rich in vegetables, legumes, fruit and beans, eating fermented foods like yogurt, kefir and sauerkraut, supplementing with a high-quality probiotic formula and cutting back on artificial sweetener, which may negatively affect gut bacteria.